Orchids need at least 6-8 hours of bright indirect light or morning sun. Light is the key with growing orchids – without enough proper light, an orchid may live 20 years but never rebloom. 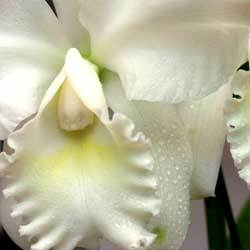 Orchids are tropical and some varieties require from 65-75 percent humidity. The plant can sit on pebbles in a water-filled tray that is kept filled up as it evaporates. Grouping orchids can also improve their collective humidity. 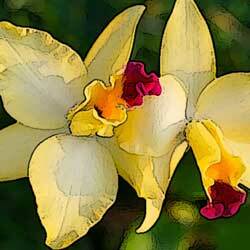 Ideal orchid temperatures vary depending on the type of orchid and the time of year. Warm orchids require 55-65 degrees temperatures at night with daytime warmth reaching 75-85 degrees. Cool orchids need the same night time temperatures, but only 65-75 degrees during the day. Water the plant every 5-7 days in the sink, as the growing medium has fast drainage. 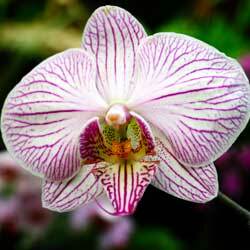 Smaller orchids may need watered every 3-4 days. The water should be room temperature and without any additives other than fertilizer. Use a Blossom Booster fertilizer with every other watering while in bloom. When not in bloom, use 30-10-10 fertilizer every two weeks. Use only a potting mixture designed for orchids. These mixes are made up of different size fir bark pieces, perlite and even charcoal. Repot your orchid when it is nearly overgrown with roots and is not in bloom. This will average about every 2-4 years. After blooming or producing new growth, most orchid varieties go into a rest period. Reduce the watering slightly and maintain good lighting to allow them to reenergize. Each type of orchid requires different conditions to bloom (example: Phalenopsis need 6 weeks of cold nights). When you achieve that delicate balance and your orchid bursts forth with a delicate bloom, make sure you do not change your cultural practices or the plant will abort the buds. Even a small change in humidity, temperature or light can cause the plant to abort its bloom, but when you keep the conditions stable, you’ll enjoy the reward these exotic flowers offer.